San Ramon FC played their 2nd ever match of the NPSL season, losing by a score of 4-1 to visiting FC Davis last Saturday in San Ramon. 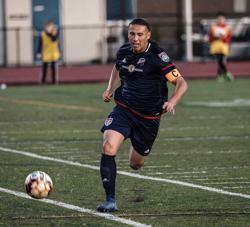 Coming off an exciting victory in their NPSL debut, San Ramon FC was unable to duplicate that result against a determined and skillful FC Davis club. Both teams began the match with a fast-paced, attacking style that created a handful of early scoring chances but no shots on goal. Near the 20th minute, Davis applied sustained pressure on San Ramon’s defense and goalkeeper, Kevin Gonzales. The defense cleared one ball off the goal line and Gonzalez made a diving save on another dangerous shot. After earning 3 successive corner kicks, FC Davis scored when Evan Barrett collected the ball at the top of the penalty box and drilled a shot in from distance. Barrett scored again a few minutes later to increase the lead. Late in the half, San Ramon nearly pulled one back. Using a long free kick to place the ball deep into the penalty box, the team appeared to score in the 44th minute on a diving header. Unfortunately for the home side, an offside call erased the goal. When the whistle blew, the visitors carried a 3-0 lead into the locker room. San Ramon resumed their attack immediately in the 2nd half. Team captain Tavo Guzman fired a shot from distance over the crossbar. Shortly after, an SRFC player's free-kick from the left side curled into the box, but San Ramon’s header went off the mark as Davis’ goalkeeper charged out to defend it. San Ramon broke through minutes later. In the 51st minute, a long cross from the right side of the field switched the point of attack. San Ramon’s Jesus Maldonado sped down the left side, winning the ball and beating his defender. He carried the ball quickly into the box and forced another defender to hesitate with a quick feint. Maldonado pressed in towards the left post and his strong shot found the back of the net. With the score at 3-1, San Ramon continued to press the attack. Unfortunately, FC Davis collected another goal, heading in a corner kick to increase the lead to 4-1. San Ramon did not yield, working hard to create opportunities and break down the defense. Several chances emerged in the waning minutes of the match, but a diving save and a shot off the post kept the ball out of the goal. San Ramon FC will play again at 12 pm on Saturday, April 6, in San Francisco against El Farolito. The match will be held at Boxer Stadium. The team returns home on April 13 when it hosts Sacramento Gold at Dougherty Valley High School.